kakagigil itong commenter. akala mo ang ganda. ang swangit swagit naman. sabi nga ni ruffa sa miss world answer niya: beauty is beyond the naked eye, what is more important is your character and integrity. 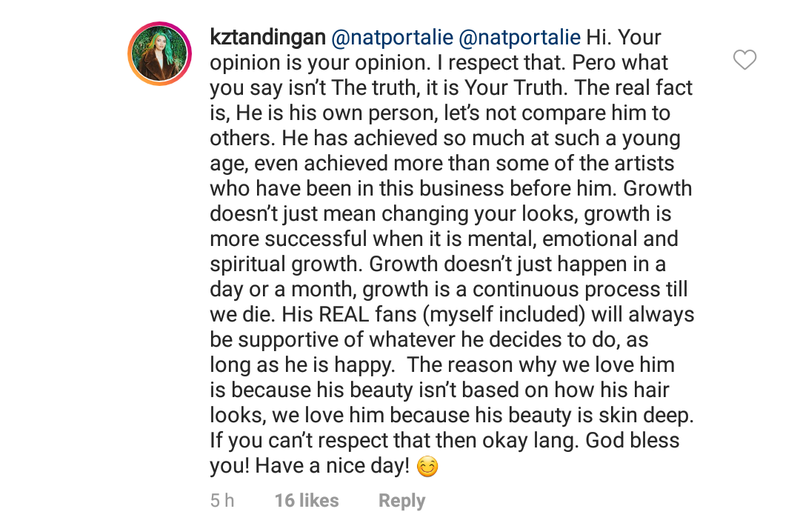 thankz kz for defending inigo. he is well loved. a great kid. he is not just a pretty face, he is more than that. he has talent and much more he has the heart. I beg to disagree KZ, if it wasn't for his father who paved way for his career he wouldn't be even known or given a chance. He's a one hit wonder who banks on his father's connections more than his talent. He may be talented now as you claim but that came after his father giving him the easy way in unlike other more talented struggling artists who have no one to back them up. 12:58 at the end of thw day it still boils down to the fact that the kid is talented and good hearted. by the way bata pa naman siya he still has very long way to go. 1:58 nope it all boils down to him having it easier compared to more talented and deserving artists. He's privileged he has a celebrity and known father to open the door for him in his career where as others are like going through a needle just to have doors open for them. It is more difficult for him to shine because of his father. Like what happened to KC. So please be kind ..
Time will tell... ang daming anak ng artista na nasa showbizz pero wala rin kasi walang talent or charisma. Look at kc... anak ni sharon... wala na sa showbizz. Anak ni Lorna and Rudy... they didn’t make it big like their parents. Pero meron naman na mas successful sa parents/ relatives... like Daniel Padilla. Parents / relatives may open the door but hard work, dedication and luck are also factors in determining success. Kahit na May connections... kung di meant wala talaga. as if kasalanan nya na anak sya ni piolo? everyone has his way of getting into something don't make it seem bad for inigo. dami artists na anak o kapatid din ng atista but ultimately, kung walang ibubuga di uubra. he has proven himself with flying colors away from his father's shadow. Having it easier does not mean success. It’s what you do and accomplish once that door is open. Anung open the door, more like ramming down our throats noh! Not his fault na papa nya si P. And may talent naman talaga si Inigo. Bitter mo naman. THE DOORS OPENED FOR HIM BEC OF PAPA P BUT DOES HE HAVE TALENT?? DEFINITELY!!!! People can bash him all they want, pero this kid has what it takes to be succesful in showbiz. INGGIT LANG YUNG IBA D2 KASI HINDI SILA ANAK O CONNECTED KAY PAPA P. SORI GUYS, TRUTH HURTS! IÑIGO IS LUCKIER THAN U & DATS A FACT! LUMUNOK NA LANG KAYO SA SOBRANG PAGKA-INGGIT. WANT SOME MORE AMPALAYA JUICE??? LIKE IT OR NOT, MAS SIKAT SI INIGO KESA SAYO, BASHER...IKAW, HANGGANG DYAN KA NA LANG SA KEYBOARD MO, HA HA HA! WAWA KA NAMAN, WALANG MAIPAG-MAMALAKI. WALA KANG BINATBAT!!! SI INIGO, MERON SYA NA WALA KA!!! 'We love him bec his beauty is skin deep'. Mali ata si KZ. mali ka nman ng comprehension sus. Baka kasi makapal ang balat nya. pwedeng-pwedeng pang-international si inigo when it comes to looks and talent. so, go go go inigo! as for the basher, tawanan na lang kasi obvious na iba lang ang idol at gusto lang i-put down si inigo. more blessings kay inigo, more wrinkles kay basher. Debatable. So-so lang and won't even make the cut for an international artist. Maghunos dili ka rin sa pwedeng-pwedeng pang-international si Inigo, kasi parang hindi rin. At tsaka, bakit ba pinagpipilitan ang international career ng mga artista?? Pwede namang maging kuntento at masaya sila sa natatamasang success nila sa Pilipinas. yep inigo sounds so good. the songs in his first album are so nice sarap pakinggan. 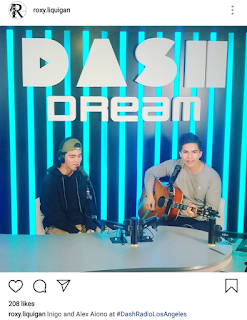 he has other collabs with other artists that are so nice basta may special sound sya.astig. Sabi nga ni Vhong sa Showtime Birthday prod niya, "Kahit hindi ka guapo basta marunong ka lang magdala ng damit, ok na." Agree. Hope Inigo can improve his styling. No question sa talent. Fashion fail lang. hindi naman pangit si inigo ah. although mas maraming gwapo pa kaysa kanya i cant categorize him as panget. gwapo siya forme at mas lalong nagiging gwapo dahil may talent siya. and i think he is good hearted. I like what KZ said. Love niya talaga si Inigo. Nakakaloka lang ang pa-essay ng basher. Daming time! basta ang masasabi ko lang, gusto ko si inigo. mahusay siya at gwapo siya para sa akin. susme, pinoproblema na di kumakanta ng mataas si inigo. gusto pala niya ng bumibirit, bakit siya tutok kay inigo? as if naman ang gagaling ng dalawang ito. kz and inigo are both mediocre. mga WALEY! magaling nman talaga sila no! magaling silang mag TH na international look kahit di bagay lalo na si KZ. mga ibang nabanggit nyang lalake wala nmang talent kundi magpa-cute,di nman din makaka ta ng di lipsync,bano din umarte.kanya-kanyang style lng yan. korek! 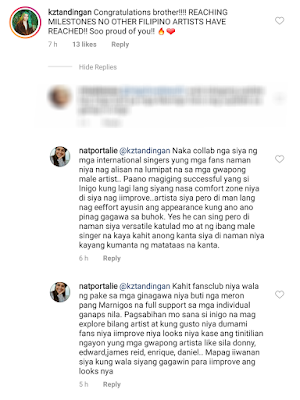 pero pusong pinoy ang bata.napakabait at di nya kasalanan na anak sya ni piolo.in fact piolo didn't really want him to join showbiz but it is his destiny at sumikat sya dahil may talent sya talaga. at guapo humble at mapagmahal sa pamilya kaibigan at fans. Wala sigurong social life or kaibigan in real life yung basher noh? 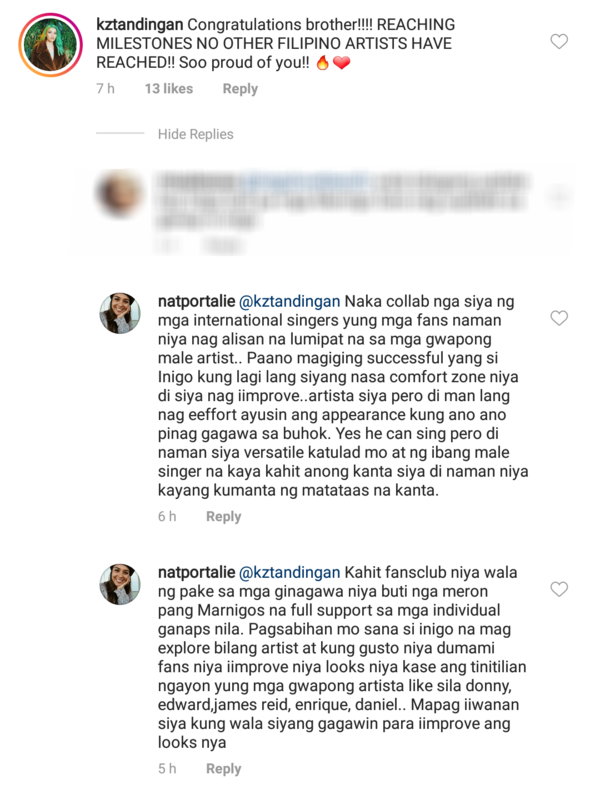 guapo kaya ni inigo!mabait pa. yang basher na yan nasopla na rin ni markus to eh.she wrote the same thing daming time laitin si inigo e sya mismo di nya mabago sarili nya paulit ulit lang copy paste e. i like how kz handled her.iba si inigo i've always seen something special in this boy. he will soar higher. kung wala si piolo, wala si inigo. swerte lang niya nag hit ang song niya. ang problema lang sa stage performance niya halatang sinasapawan niya ng costume ang mga kasama niya. pasalamat siya sa papa niya. imagine binibigyan siya ng talagang exposure with the lead stars ng asap natin ito. maraming mas magaling sa kanya. Management sees inigo as more apt to perform on asap stage ano problema mo dun? piolo doesn't decide wh steps on that stage no. alam mo sa showbiz it's not just the looks, the talent and all- which inigo all possess. it's attitude and pakikisama sa lahat ng tao. He is a talented kid who seems to be walking down a straight path. 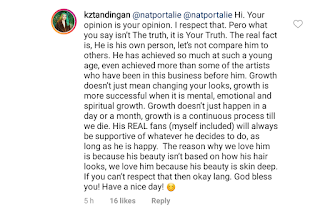 And he's appealing, confident..maybe not yet as handsome as the dad but if he gets his ears pulled back, I reckon he'd be pretty darn close - which isn't an insult because Piolo is a looker. But Inigo is more talented. 5:25 I agree though i must say inigo is also just as handsome as his papa. they have the same profile, built though piolo is more photogenic in most angles. Inigo is very guapo and simpatico in person, more so when he starts to perform. Amongst artist na narinig ko... He is far better than anybody else as of this time. EXTENSION, DITO, and DAHIL SA YO ay MGA songs na when you listen carefully, Inigo will bring you close to believing that he is indeed himself... Not asking to be compared to anyone else... He is unique. And if for some instance again macompare sya kahit pa SA tatay Nya... Think again... Magaling Siya talaga.... and SA MGA taking pilot pa ding magkumpara ng ibang tao SA IBA please Read DESIDERATA. And for Inigo... Continue with what you are doing... I enjoyed listening to ur music because it really keeps me going... Kudos on your next projects. IKR? His Lullabye, Fallen and Live Life Brighter are also so good. His latest yung lumang tugtugin oh my so nice din kaya. esp when you listen with headsets on haha. when he sings live, he sounds even better and with matching dance moves. Meh, he doesn’t have much talent or good looks. Pilit lang danil sa papa niya. Maybe what you’re saying is true that he is a good boy paris ni Papa P. Masyado lang weird ang ginagawa niya sa buhok niya and medyo May kaangasan na kung umarte ngayon. One hit wonder lang naman siya paris ng iba. His difference is producer ang tatay niya ng kanyang mga pelikula na flop naman. Nope he doesn't have kaangasan like you're saying. magaling si inigo. He loves his fans he is very humble and well-liked by even the security guards, cleaners, crew etc these people are the ones who truly know who is who in their workplace. abs talents can attest to his humility yung tipong sya ang unang babati sa mga ito even babalik just to show respect. That's one of the reasons he soars higher. Attitude. He is 21 and can experiment on his looks for all he wants just like the rest of us.